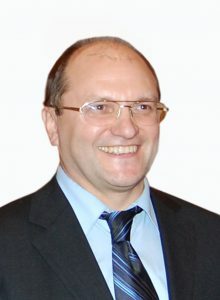 Sergey A. Babin received MSc in physics from the Novosibirsk State University in 1983, and PhD (1990) and DSc (2003) degrees in physics and mathematics from the Institute of Automation and Electrometry of RAS Siberian Branch (Novosibirsk, Russia). He has been working as a head of the Fiber Optics Laboratory since 2007, and as an acting director of the Institute since 2018. He is also Professor of Novosibirsk State University giving lectures on fiber optics at Physics department. He is a corresponding member of Russian Academy of Sciences (RAS), member of OSA and IEEE Photonics societies, chief editor of Applied Photonics journal (in Russian). His scientific achievements include the development of the longest Raman fiber laser (300 km) in collaboration with colleagues from Aston university. He and his team proposed and demonstrated random Raman fiber lasers with record parameters (efficiency, polarization extinction ratio, tuning, etc. ), as well as other novel schemes and regimes of Raman fiber lasers. The spectrum broadening in fiber lasers has been also described. Fundamental limitations for chirped pulses found and femtosecond pulses with maximum energy in an all-fiber oscillator have been generated. Their efficient Raman conversion enabling generation of femtosecond pulses at new wavelengths has been also demonstrated. Femtosecond technology of writing fiber Bragg gratings (FBGs) through the fiber coating with unique lasing and sensing characteristics has been developed. Diode-pumped Raman fiber lasers in multimode graded–index fibers with fs-pulse inscribed FBGs generating near diffraction limited output beam have been demonstrated. Various laser and sensor systems for industrial applications (communications, biomedicine, material processing, infrastructure and energetics) have been realized.